Did you know that right now there are hundreds of CREATE Young Consultants around Australia, stepping up to be the voice for children and young people in care? Each year CREATE trains over 200 new Young Consultants as part of our Speak Up program. After completing the Speak Up training, young people can choose to become CREATE Young Consultants, undertaking a variety of roles from public speaking, to helping with CREATE research and events. 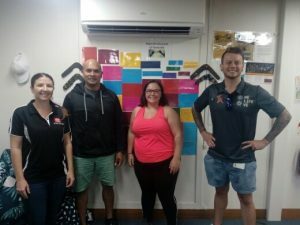 Recently our Senior Community Facilitator in Townsville, Donna, interviewed a new CREATE Young Consultant – Kayde. Kayde has just hit the ripe old age of 18, achieving many goals already with more already planned for the future. Kayde, I heard you are studying psychology next year at university, may I ask what interested you in studying psychology? Throughout my time in care I had many problems with my mental health and there was never any support for me. This frustrated me a lot so I thought about going into university to study psychology so I can provide mental health support to other people. I also had a little birdy tell me, you have an entire house to yourself! How are you finding it? Is there more freedom when you have your own place? I love it because of the privacy, having my own bathroom is amazing! It is very weird having my own place though, I still sometimes call my grandma about decisions I need to make. The best freedom I have is I can eat where I want and sleep where I want. I love that I can wake up when I want when I am not working, I can shower as many times during the day and I can read all night long without getting harassed. Do you have any pets give you company at your house? Yes I have two cats, their names are Misty and Arthur, and they are both 10 months old. I also have two rats, Butters and Bean they are both two months old and right now I am teaching them how to play basketball. How do you teach a rat to play basketball like Lebron? You have to put peanut butter on your finger and lead them to the ball with peanut butter on it. After this you started moving the hand and ball with peanut butter to the hoop to teach them play basketball. Now before we finish this article is there anyone you want give shoutouts to anyone for help to get to know where you are now? Next Step has been an awesome help these last few months especially with a mouthguard I needed for many years, we also went on a shopping spree to get heaps of clothes because they are expensive! I also want to give a thank you to QYS they helped me always keep on track with making sure my bills were paid on time. Thank you Kayde for the chat and I hope you enjoy psychology next year at university as well as teaching your rats to be like Lebron James. Kayde, far right, with QYS staff.